1 camera da letto, 1 bagno. 2 letti queen size, 1 matrimoniale sonno-divano. Cucina completamente attrezzata. Mobili per lo più nuovi. HVAC centrale. 2 ascensori di servizio 84 condomini nel palazzo. Serratura elettronica in modo che siano pronti per inserire il tuo alloggio quando si arriva a OC senza una sosta a un ufficio immobiliare per le chiavi. TV in camera familiare e camera da letto. 18 'di vetro si apre sul balcone privato. Vicino a ristoranti, attrazioni, e il lungomare, che si trova a 3 isolati di distanza in via 27. Devi avere almeno 25 anni per l'affitto. Gli affitti di alta stagione sono di 7 giorni, da sabato a sabato. My wife and I had a very relaxing stay. The condo is very clean and well appointed. The kitchen is large and easy to use. We recommend this property. This property was well-maintained, very clean, and had an outstanding ocean view from the balcony. We were extremely impressed during our stay at this property. This property was well-maintained with updated furnishings and with cable in both the bedroom and the living room. This property was also very clean and modern. The ocean view from the balcony was also breath-taking. In fact, we made sure to enjoy it each morning and every evening. The owners were exceptional as well. Ed made sure to message us immediately once the first payment had been made. 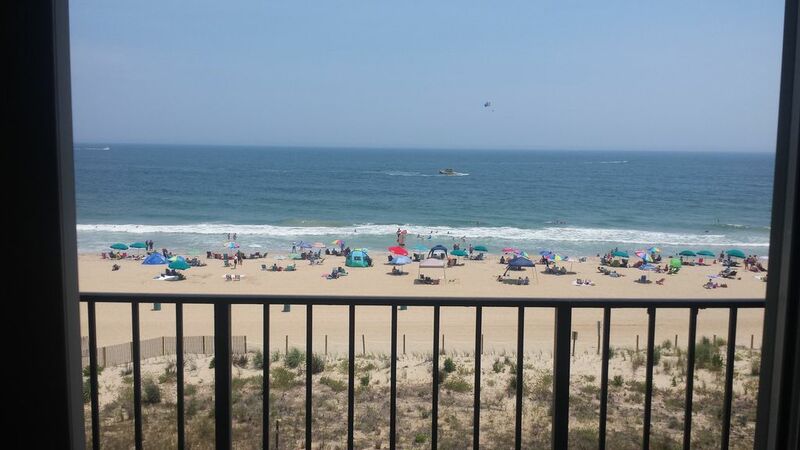 He also provided us with information about the condo, parking permit, and additional restaurants and things to do while during our stay in Ocean City, Maryland. This information was not only provided to us via a message, but also via an email as well. We are definitely looking forward to staying at this property again in the future. The 4th floor Condo was as stated & described. Balcony view was great, directly on beach, about 100 yards from ocean. The condo was nicely furnished. The kitchen was adequate. We were very happy with the accommodations! We intend to return. Check in and check out couldnt have been easier. Also loved not having to keep track of a key. Perfect condo in the perfect location. My daughter and I had a wonderful time despite the dreary weather. Loved the beautiful sunrise from the deck. Also, the guarded beach was just steps away. We also were able to enjoy the pool even though it was after labor day i was thrilled that it was still open. Thanks Ed and Carol for opening your condo up for others to enjoy. Why go to the beach if you can’t see and hear the ocean all the time? The view from this comfortable place is great! And at 30th Street, it’s a perfect location. Nothing negative about this place. You won’t be disappointed. We’ve stayed at this property two years in a row. Owner is wonderful to work with. Had another wonderful time! !